Lipid and macrophage accumulation in lesions of the aortic root. Sequential sections of the aortic root (situated between level 0 and 1) stained for lipid with Sudan IV (A, C, E, and G) or for CD68-positive macrophages (B, D, F, and H) from GLO1TGApoe-/- mice (C, D, G, and H) or nontransgenic Apoe-/- litter mates (A, B, E, and F) that had been administered streptozotocin (E–H) or vehicle (A–D). From: Geoffrion, M. et al. 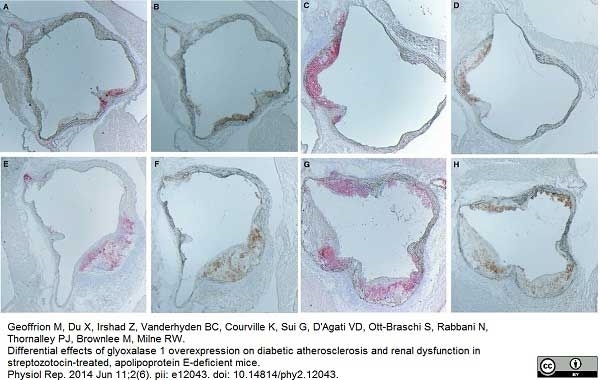 Differential effects of glyoxalase 1 overexpression on diabetic atherosclerosis and renal dysfunction in streptozotocin‐treated, apolipoprotein E‐deficient mice.Physiological Reports 2014 Vol. 2 no. e12043. 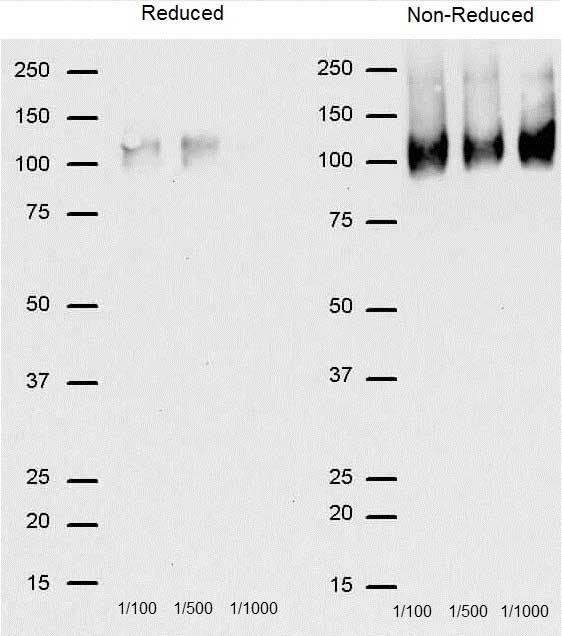 Goat anti Rat IgG antibody recognizes rat IgG. 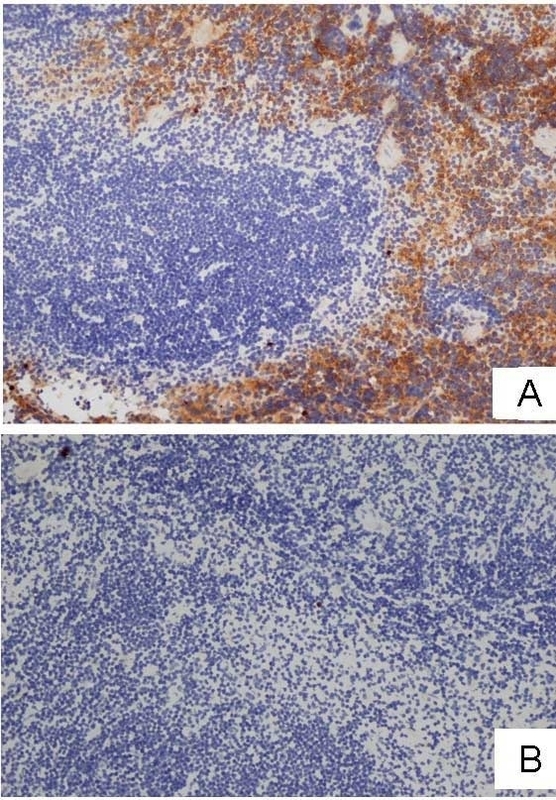 Cross-reactivity with mouse immunoglobulins has been removed by solid phase adsorption. Antisera to rat IgG were raised by repeated immunisation of goats with highly purified antigen. Purified IgG was prepared by affinity chromatography. Sato, J. et al. (2003) The fibrinolytic system in dissemination and matrix protein deposition during a mycobacterium infection. Am J Pathol. 163 (2): 517-31. Teupser, D. et al. (2004) Major reduction of atherosclerosis in fractalkine (CX3CL1)-deficient mice is at the brachiocephalic artery, not the aortic root. J Chin Adv Mat Soc. 2: 118-29. Thirunavukkarasu, S. et al. (2016) Cytochrome P450 1B1 Contributes to the Development of Angiotensin II-Induced Aortic Aneurysm in Male Apoe(-/-) Mice. Am J Pathol. 186 (8): 2204-19. Hadzhieva M et al. (2016) Relationship between natural and heme-mediated antibody polyreactivity. Biochem Biophys Res Commun. 472 (1): 281-6. VonFurstenberg, R.J. et al. 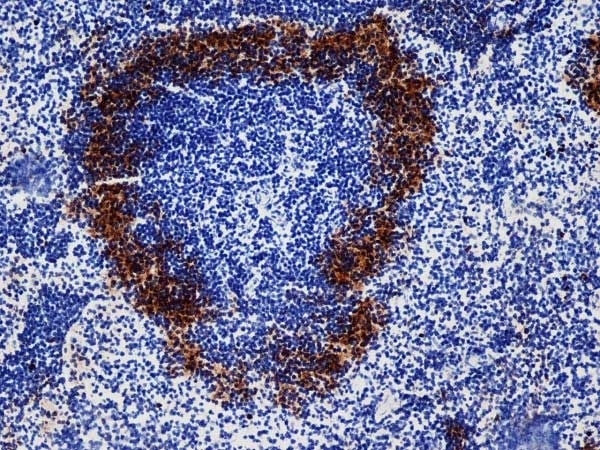 (2011) Sorting mouse jejunal epithelial cells with CD24 yields a population with characteristics of intestinal stem cells. Am J Physiol Gastrointest Liver Physiol. 300 (3): G409-17. Mueller, M.A. et al. (2008) Prevention of atherosclerosis by the mTOR inhibitor everolimus in LDLR-/- mice despite severe hypercholesterolemia. Luo, Y.B. et al. (2013) Primary over-expression of AβPP in muscle does not lead to the development of inclusion body myositis in a new lineage of the MCK-AβPP transgenic mouse. 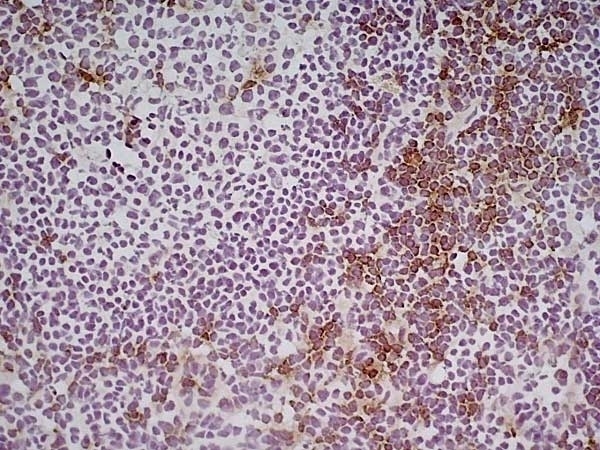 Int J Exp Pathol. 94 (6): 418-25. Janardhan, K.S. et al. 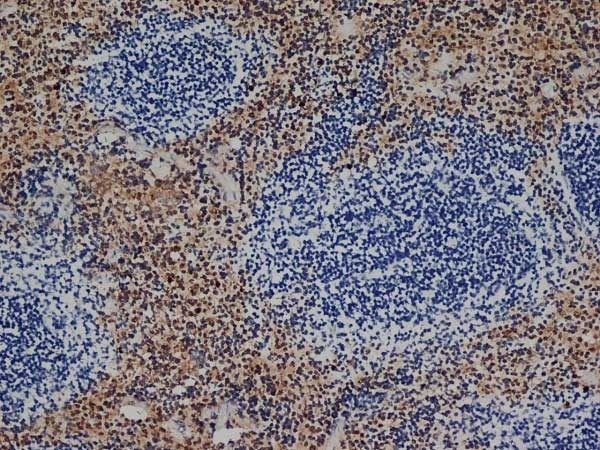 (2012) Integrin β3 is not critical for neutrophil recruitment in a mouse model of pneumococcal pneumonia. Cell Tissue Res. 348 (1): 177-87. Schmidt, N. et al. (2014) Dietary vitamin D inadequacy accelerates calcification and osteoblast-like cell formation in the vascular system of LDL receptor knockout and wild-type mice. J Nutr. 144 (5): 638-46. Harrison-findik, D.D. et al. (2009) Regulation of liver hepcidin expression by alcohol in vivo does not involve Kupffer cell activation or TNF-alpha signaling. Am J Physiol Gastrointest Liver Physiol. 296 (1): G112-8. Harcourt, L.J. et al. (2005) Interleukin-15 administration improves diaphragm muscle pathology and function in dystrophic mdx mice. Am J Pathol. 166 (4): 1131-41. Geoffrion, M. et al. (2014) Differential effects of glyoxalase 1 overexpression on diabetic atherosclerosis and renal dysfunction in streptozotocin-treated, apolipoprotein E-deficient mice. Physiol Rep. 2 (6)Jun 11 [Epub ahead of print]. Elitok, S. et al. (2006) Cyclic arginine-glycine-aspartic acid peptide inhibits macrophage infiltration of the kidney and carotid artery lesions in apo-E-deficient mice. Am J Physiol Renal Physiol. 290 (1): F159-66.